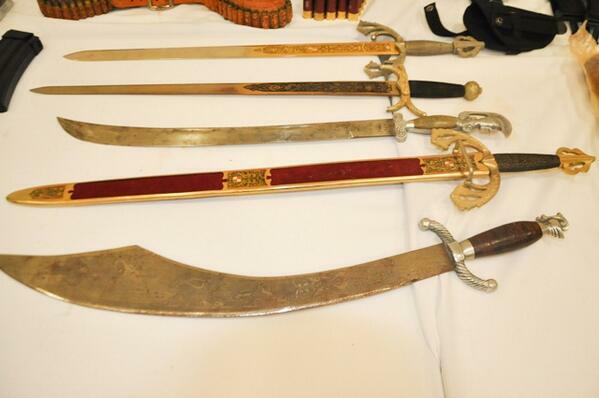 Police arrested three alleged members of the Knights Templar cartel and seized a huge stash of firearms and illicit narcotics at a safe house in Guadalajara at the weekend. Metropolitan police officers stopped the three men as they were driving along Circunvalacion Oblatos late Saturday night. The officers found three pistols and 179 grams of marijuana aboard their red Chevrolet pick-up truck. The detainees were identified as Eladio Govea Perez, 33, Adrian Agustin Ortega Navarro, 26, and Efrain Vazquez Duarte, 46, all from La Romera, Tepalcatepec in the state of Michoacan. They are believed to be members of the Knights Templar cartel based in Michoacan, and have links to organized crime in Colombia and the United States, said the Jalisco Prosecutor General, Carlos Najera. The men were captured after the Federal Attorney General’s Office (PGR) provided the state authorities with information on four suspected Templars operating in Jalisco, but the leader of the cell is believed to have evaded arrest, local newspaper El Informador reported. The arrests led to the discovery of a safe house at the intersection of the Clemencia and Vergel streets in the San Isidrio Oblatos neighborhood on Guadalajara’s east side. There the police found 41 kilos of cocaine, 17 kilos of crystal meth, half a kilo of marijuana and 11 kilos of chemical precursors used in the production of synthetic drugs. 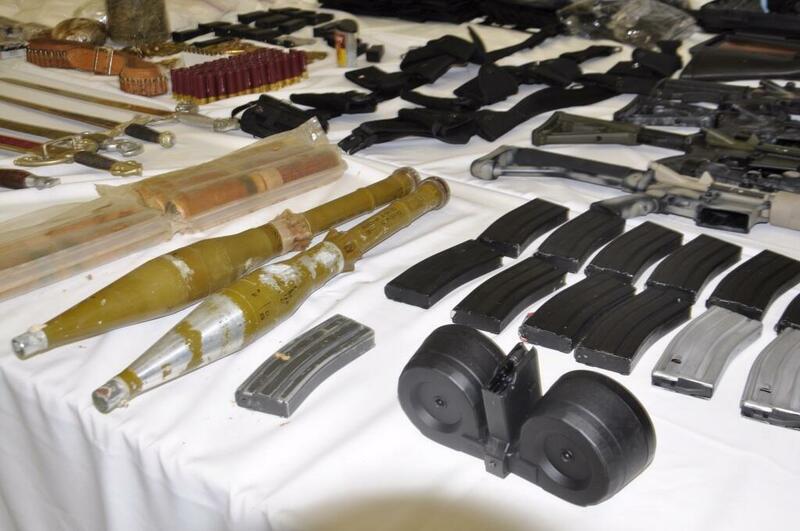 The officers also confiscated an extensive arsenal of 28 guns, including AR-15 and AK-47 assault rifles; 1,189 rounds of ammunition and 34 magazines; two rocket-propelled grenades (RPGs) and several RPG launchers; five gold-plated swords; five bulletproof vests; a money counter and 440 dollars; and eight vehicles. 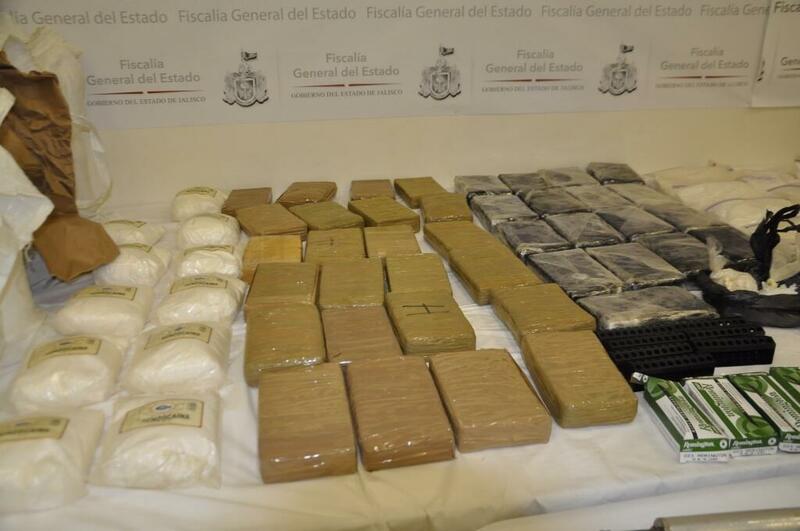 “According to the initial statements given by the detainees, the drugs stored in this property were transported to Piedras Negras, Coahuila and from there to Houston and Chicago in the United States,” Najera said. The suspects had been trafficking drugs through Guadalajara for about a year and were trying to expand their cell, Najera added. The arrests come amid a wave of violence between the Knights Templar and vigilante groups in Michoacan. Under strong pressure to clamp down on the cartel, which has established itself as the de facto authority in much of the western state, Mexican authorities have now arrested over 40 suspected Templars in recent weeks.